Our son Graeme was born on March 12, 1974. Even as a baby, he always loved to be outdoors. When he was very young, we took him for long walks on the trails along the Credit River valley near our home in Mississauga. We introduced him to the beauty of the rushing water, the dense forest, the bird life and the wildflowers. When he was only four months old, Graeme became a true camper. We filled the car with baby gear and set off for the northwest shore of the Bruce Peninsula. The fresh air must have agreed with him because he slept soundly each night, oblivious to the storms that raged around our tent. The days, however, were bright and sunny, and he slept in his baby carrier for most of our long walks along the rocky shore. 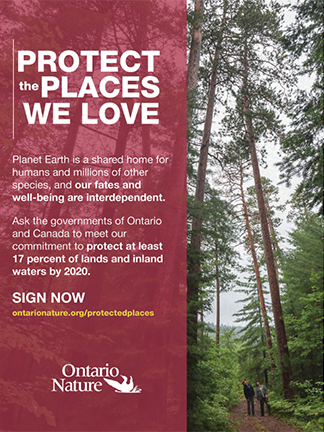 During the next decade, we camped in most of the provincial parks and conservation areas in southern Ontario. Graeme was able to explore lakes and rivers, sand dunes and wetlands, caves and mighty cliffs and to observe all the wildlife living there. His favourite adventures were in our canoe very early in the morning when many creatures could easily be seen in the water and on the shore. When Graeme was in his early teens, we started travelling outside Ontario and then outside Canada. He explored the Pacific coast of Vancouver Island and the beautiful forests, lakes and mountains of the interior of British Columbia with us. We floated around the Queen Charlotte Islands on rafts and camped in the rainforests. A National Geographic special about the Galapagos Islands convinced us to go there. It was a most memorable trip. At the end of the 1980s, only a very few tourists were allowed to visit the Galapagos, and on our 10-day cruise on a small boat we were the only people hiking on the islands. 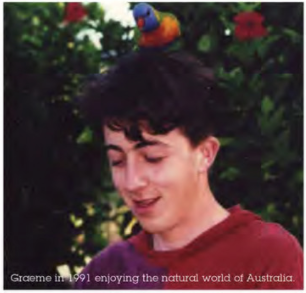 In the summer of 1991, Graeme and his friend Tim set out with us in a rental RV to discover Australia. It was a remarkable, six-week trip. The vast outback, the beautiful rainforests and Heron Island paradise on the Great Barrier Reef were stunning – and also a perfect backdrop for girls, music, beer and everything Aussie. Graeme was an avid reader. He liked books about nature, but he didn’t read animal stories because he thought that they would be too sad. He read all of Gerald Durrell’s humorous stories about life as a naturalist and a traveller. I think that Graeme would have liked to follow in his footsteps. At the beginning of Grade 13, Graeme was diagnosed with a very rare bone cancer. Tragically, he died on April 23, 1993 just after his 19th birthday. Because of his love of nature, we thought that a “Graeme Whistance-Smith Nature Reserve” would be the perfect way for him to be remembered. If he were alive today, Graeme would be very pleased to know that a small part of our beautiful province would be protected in his name as a safe haven for many of the plants and animals that had so fascinated him. Graeme’s story inspired Ontario Nature to create a Legacy Grove in our Cawthra Mulock Nature Reserve. A tree dedicated to Graeme is the first of many that will be a living legacy in honour of people who have passed away. 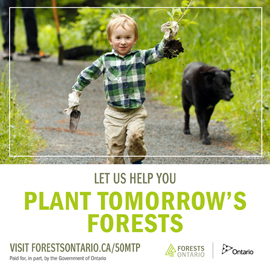 Every spring, more trees will be planted and more lives will be honoured for people who include Ontario Nature in their estate plans. If you would like to talk about your donations or other ways to get involved with Ontario Nature, we would love to hear from you. Contact Caroline Schultz, executive director, at 416-444-8410, ext. 237, or carolines@ontarionature.org. This September, some 250 enthusiastic participants showed up at the joint Ontario Nature and Ontario Power Generation (OPG) Cootes Paradise Biodiversity Festival despite cold and blustery weather. The family-oriented event, held at the Royal Botanical Gardens (RBG) in Burlington, Ontario, inspired people of all ages to consider how we can protect biodiversity in local environments. Attendees paddled canoes, went on guided hikes and planted native prairie species. They also got up close and personal with a beaver from the Muskoka Wildlife Centre, a great horned owl from the Mountsberg Raptor Centre and rat and garter snakes from Sciensational Sssnakes! Says Barbara MacKenzie-Wynia, Ontario Nature’s regional Nature Network coordinator, “We have had extraordinary partnerships with so many organizations at the grassroots level right up to OPG. Everyone really came together to provide these communities with a great experience.” Participants explored the RBG’s interpretive centre and surrounding Cootes Paradise ecosystem, where as many as 200 bird species can be spotted during the fall migration. Adds MacKenzie, “Corporations can do amazing things. With their sponsorship, OPG helped us meet hundreds of people who love nature and care about biodiversity.” Visit the Ontario Nature website for updates about upcoming educational events and other programming scheduled for 2011. For further information on OPG biodiversity events, visit www.opgbiodiversity.ca. Concern for deteriorating nesting platforms and poor bird monitoring led to the founding, in 1995, of Friends of the Osprey in the Kawartha Lakes area. The group, which has more than 150 members, is a one-stop shop for osprey conservation. It holds talks and seminars at elementary schools, colleges, seniors’ homes and youth groups, raising awareness about the masked raptor and its habitat needs. Members also monitor osprey populations, conduct surveys and rescue osprey nestlings that get blown out of their nests during storms. With help from supporters at Sir Sanford Fleming Community College, the group has built 30 osprey nesting platforms mounted on six-metre cedar poles. The elder of the two ospreys, bird 95050, left Sturgeon Lake on August 30 and at press time was located off the coast of Venezuela. The younger osprey, bird 54706, lagged behind, heading south on September 2, 2010, and was last spotted in Puerto Rico. Friends of the Osprey members believe that the ospreys are probably close to their wintering grounds. As the ospreys departed, onlookers were concerned that the raptors would pass over the BP oil spill in the Gulf of Mexico, putting them at risk of getting covered in oil as they dived for fish. Fortunately, the ospreys bypassed the gulf on their way south. Now, Friends of the Osprey members eagerly await the birds’ return to the Kawartha Lakes next spring. I joined Friends of the Osprey in 1995 because of my father, who passed away 11 years ago at the age of 94. My father had a ritual. Every March, he would drive to the junction of Emily Creek and Sturgeon Lake daily to check on the return of the ospreys. For a few years, the birds would arrive on April 10 no matter what the weather, in sleet, rain or snow. Only on rare occasions could I join my father on these outings, but each year he would phone me, happy and proud that he had witnessed, once again, the arrival of the ospreys. By strange coincidence, one of the birds that we tagged was nesting on a platform that my father had observed closely for years. Even now, their return to this area is the best day of the year for me. My name is Tim Fox and I am the “Tim” referred to in the text on Graeme Whistance Smith. I have unfortunately lost contact with Peter and Suzanne and would dearly like to speak with them again as it has been many years since we last communicated. You must have had some fantastic adventures together! Thank you for leaving your email. It has been provided to John Hassell, the ON Nature magazine Editor, and we will be able to help out here by giving your contact information to Suzanne. My name is Kate Murray, I would like to reconnect with Tim, Suzanne & Peter and came across this article. Please could you also pass along my info to them all. Strange how I came across this, as this week marks 25 years since he passed.